NEW DELHI:The top leader and the god-father of BJP , Lal Krishn Advani, once again hints to the PM Modi, " The leaders must have the values and the moral." Not only this, he said also that he had resigned on moral ground only on allegation of Hawala. In an interview to a news paper he said that there must have to maintain the integrity in public life in response of a question based on Lalit Modi controversy. However he stated nothing directly on Vasundhara Raje and Sushma Swaraj.Mr. 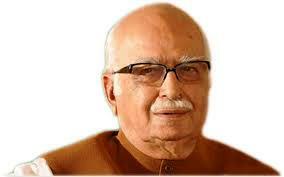 Advani in his previous interview had said that the emergency apprehension in the country might not be denied. Advani’s statement came at the time, while Swaraj and Raje are facing the controversy of Lalit Modi. Congress is bent upon the resignation of both the leaders who involved in the issue of helping IPL chief Lalit Modi. It is noteworthy that Mr. Advani had resigned from membership of parliament after the allegation of involvement in Hawala scam in 1996 and after clean chit he was re-elected for the parliament in 1998. Hawala professional S.K. Jain’s dairy was submitted as a chief evidence against the top leaders including Advani.